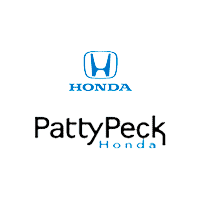 Visit Patty Peck Honda, our leading Honda dealer serving Jackson, to get behind the wheel of the 2015 Honda Civic Sedan. The country’s most popular and favored vehicle returns for another year, built to crush its competitors. With new refinements, technology, features, and class, this model will make for a fine driving experience. New for 2015 is a Special Edition SE sedan that is positioned between the LX and EX trim to offer a high-end value option. With a long legacy filled with great achievements and accolades, the brand was put to the test while creating the best version of the Civic. Engineers and designers have proved successful as fans have ranted and raved of the new features that will surely give this model an edge over its competitors. It’s your turn. Step inside and see what all the fuss is about. Contact us at our Jackson MS area Honda dealer (601) 957-3400 to inquire about the 2015 model. Remaining ahead of the competition, the 2015 model brought new features and accessories to the Civic line-up. Reliability, safety, and fuel efficiency remain steadfast characteristics of the 2015 model, only now, they’re new and improved. Powered by the 1.8L, single overhead camshaft, aluminum-alloy-iVTEC® 4-cylinder engine, Jackson Honda Civic fans will pay less at the pump as this engine produces an impressive 143 hyperactive horses while still excelling in fuel-efficiency. Our favorite brand is committed to safety so all Jackson Honda fans can drive with the peace of mind they deserve. Safety for everyone does not only consist of the brand’s drivers, but also for other vehicle occupants and injury mitigation for pedestrians as well. The 2015 Civic is filled with advanced designs and features that further enhance the safety of vehicles on the road. 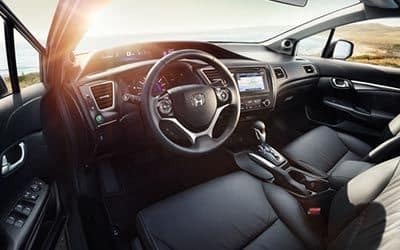 The rearview camera, standard in all Honda models, the advanced compatibility engineering and body structure, and anti-lock braking system with electronic brake distribution are only a few of the latest technologies that find their home in this 2015 model. The HondaLink™ can help all drivers and passengers access news, social media, personalize restaurant searches, Internet radio, audio books, and so much more through a connection to your smartphone. The Assist feature lets the driver request emergency services in the event of a collision that results in airbag deployment. SMS Text Messaging is a much safer way to receive text messages while on the road. Jackson Honda drivers will have the option of having their messages read aloud, displaying them on the 7-inch display screen, or saving them for later. You won’t miss a beat while on the road. The innovative Multi-Information Display communicates with all of your vehicle’s systems. The screen will display your music information, USB Audio Interface, and many other convenient displays while behind the wheel. If you’re interested in driving the 2015 Honda Civic, contact Patty Peck Honda at (601) 957-3400.